Building permits issues in the City of Los Angeles soared in the first half of 2015. The City issued over 7,000 multifamily permits in the first half of 2015 versus 9,500 permits for the entire year in 2014. 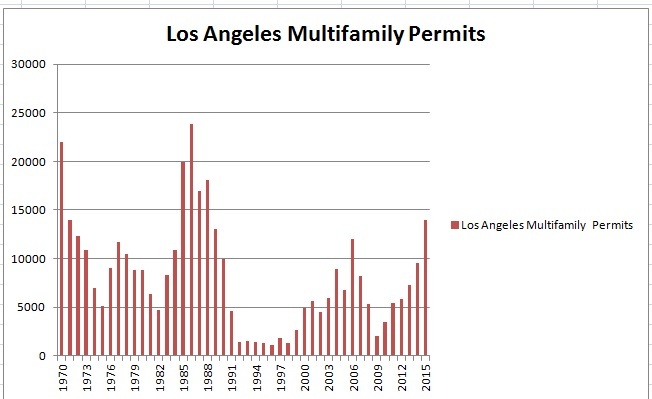 At this rate, Los Angeles will issue 14,000 multifamily permits in 2015–which would be the highest level since 1988. The Commerce Department says that metro LA saw permits issued for just under 20,000 residential units (total of all units in the metro area versus the City of Los Angeles) in the first six months of 2015, up 41.4 percent from the same time last year. We addressed the implications of the building permit data in our blog of May 2015 below. Are We Going to Have too Much Apartment Construction in Los Angeles? | PMI Properties.